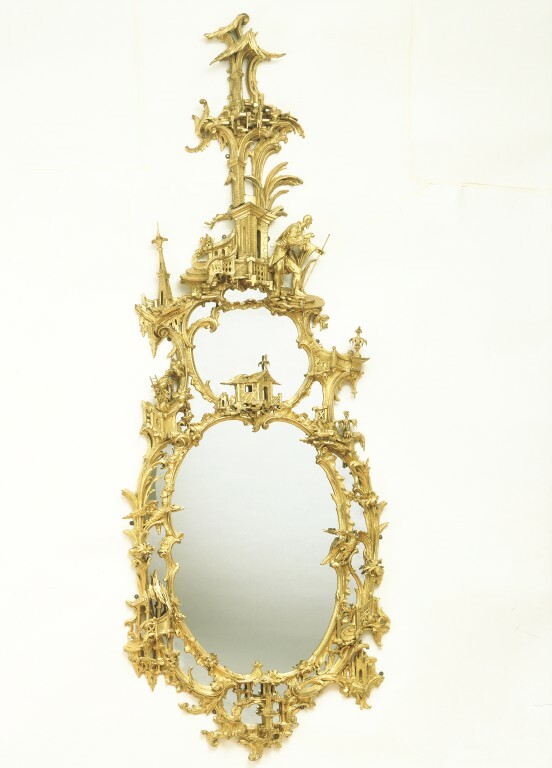 This giltwood mirror is carved with forms and figures in the Chinoiserie style. Chinoiserie is a general term for Chinese decorative work and ornamental motifs in the Chinese taste. The whole of the mirror is surrounded by a pinnacle. All the interstices (the carved crevices) of the carving are filled by mirror glass. We do not know who made this mirror, but it may have been based on the engravings published as a book (but without a title) by Thomas Johnson in 1758. Thomas Johnson (born 1714; died after 1778) was a carver and a gilder. He is known to have supplied mirrors in the early 1760s through the London upholsterer George Cole of Golden Square, Soho, to Paul Methuen at Corsham Court, Wiltshire, and the Duke of Atholl at Blair Castle in the Scottish Highlands. The mirror is ornamented with several Chinoiserie motifs, including fanciful buildings, robed figures and birds with long necks. They present a wholly fairy-tale version of China. Prior to its acquisition by the V&A, this mirror hung between the window piers in the Drawing Room at Halnaby Hall (formerly the seat of the Milbanke family), North Yorkshire. Halnaby Hall, a house with exceptional Rococo plasterwork, was demolished in 1952. From the Drawing Room, Halnaby Hall near Darlington, formerly the seat of the Milbanke family. Historical significance: Similar to designs published in 1758 by carver and gilder Thomas Johnson. (See Helena Hayward, Thomas Johnson and the English Rococo, 1964, plate 36.) A chinoiserie figure appears on one of Johnson's designs for girandoles (Hayward, plate 122) and a figure of a peasant in ragged clothes appears in Johnson's design for an overmantel (plate 87). Fountains with a triple cascade of water (plate 94), obelisks (figure 17) and ladders (figure 124) are all characteristic of Johnson's work. Johnson's 1758 book of designs was dedicated to Lord Blakeney, Grand President of the Antigallican Association and sold by Johnson from his premises at 'The Golden Boy' in Grafton Street, St. Ann's Westminster. The book included designs for glass frames, ovals, stands for candles, picture frames, slab frames, an organ, ceilings, chimney peices, brackets for figures, clock cases, girandoles, lanthorns, stands for china, silversmiths, table brackets, stove grates and watch cases. 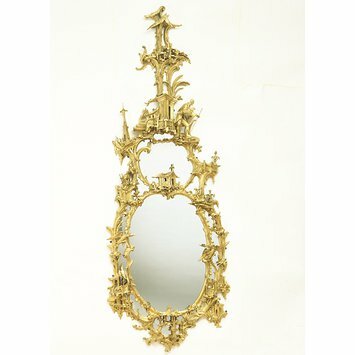 Giltwood mirror, carved with scrolls, plants, rocks icicles, architectural motifs and a figure in the Chinoiserie style. English (London), 1750-1760 or possibly 19th century. May be based upon designs by Thomas Johnson.